This package can Extract metadata from picture files in Exif format. It can take the path of image file and parse it to extract details of the image like the width, height, software that was used to generate the image. The class can extract the required details of the specified image and returns it as an associative array. extension only seems to work well with JPG and TIF files. in any given image? Who knows! Consult the "SectionsFound" element. are given easy-to-understand names like "FileName" and "MimeType." BTW, It's IFD zero, not IFD oh. will be captured, and what unuseful information will be discarded. You may want to modify these underlying assumptions. set_included_array() can be used to capture other sections of the Exif. set_required_item() can be used to limit the return to certain items. set_excluded_item() can be used to remove items from the collection. excluded items. This can be quite a lot of information. explicitly requested by the constructor and set_required_item(). Exif information from files that do not provide PHP-readable Exif. The properties are arrays that can be iterated with foreach(). build_exif_array() finds all of the Exif values that PHP knows about. image file. Call this method, then print the object to see them. that it loads faster over the internet. 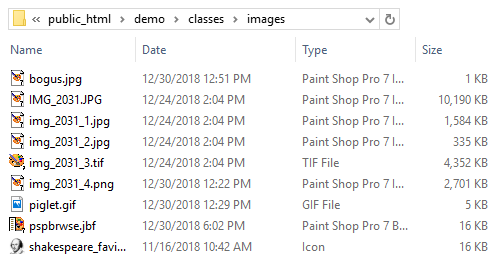 Please see the demo file for examples that use the methods.